An Illusion of Curves » What's Under the Needle? 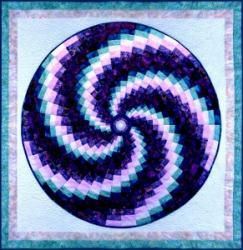 Bargello Swirl is a popular pattern which gives you all the instructions on how to complete a wonderful quilt, however, my online workshop ("Circular Bargello") gives you so much more. I made a preview of the process so you can get a quick glimpse. ..... and a preview of some past students work as well. So you see, pieced curves don't have to be complicated and an illusion of curves can be created. If you'd like to learn how, join me in my online class "Circular Bargello". Together we will learn about selecting the right fabrics, ordering them and piecing a circular bargello to create your next masterpiece.